Imperial Germany -Tsingtau, China during WWI...Document/award groups. Imperial Germany -Pilots or Observers...Document/award groups. Imperial Germany -uncommon awards and identifiable medal bars/groups. Imperial Germany -Afrika or Pacific during WWI. Imperial Russian -Awards/medals and medal bars.
" if you have something like this FOR SALE, please let me know! Over the decades I have occasionally seen this wonderful medal come up for sale. But always alone. ixhs: What else was mounted with the Atlantic Meteor medal? Thanks for showing it Uwe! Wow, what a nice group! Congratulations on obtaining the missing sleeve badge! One last consideration might be a magnifier with a built-in light. So many time the ambient light is somewhat lacking and my eyes aren't as sharp as they once were. wait a minute Chris. By suggesting this is "not rare" you are commenting that this is a "common" combination. However, lets read this ribbon bar again from what is here and what isn't. This gentleman served in WWI and earned the Hindenburg non-combatant, and not the EK2 (1914). Then WWII started and he earned BOTH the KVK2 WITH SWORDS and then an EK2(1939). So, from a non-combatant in WWI with no awards to a decorated combatant in WWII. (usually, its the other way around) I think that's kindof uncommon. No problem Wessel. I can't speak for everyone, but as collectors we certainly can start collecting things that attract our attention. And then we start researching and learning more where we gain a direction. Please feel free to post what items you collected thus far. If you have a specific question -this forum is the place to ask. Well that's a shame. I came to this thread late and missed the show. Any chance for a curtain call? Hello; Can someone tell me the criteria for this Order to be awarded? 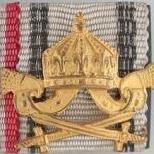 What merit/service/action would occur to earn the Order of Leopold? What do the regulations on it's issuing say? Specifically, I am wondering; 1) for the military class, 2) awarded to a uniformed foreigner (military personnel). 3) Time period; somewhere from 1860 to 1918. Could it be for; As a military liaison? a Royal Court visit? Recognized service to the country of Belgium? Rescued a Belgium citizen from fire or drowning? Great photo. And very poignant knowing where they were going. A two month stint -but I suspect that many stayed there. This appears to be a colorized photo. The medal bar is straight forward enough and they got the ribbon color correct too. from L-R; 1) Order of St. Anne w/o swords 3rd class 2) Order of St. Stanislaus w/o swords 3rd class 3) Commemorative for 300 years of Romanov dynasty The badges and pins will take a little more examination, maybe a close up too. The badge on his right pocket; After examining it closer, I think it might be for the Technical Institute of Peter the Great. The color should be bronze gilt, however I don't know if it also came in silver. wonderful groups! Great way to display them. Will it be my find of 2019???? Great group! Wow! With the Tamara. I wish Rick was still alive to see this. He would have loved it. I've been carefully looking at the ribbon wrappings, the medal mounting and overlapping. I think the photo in post 17 and the same medal bar in post 22 are same, however Laurentius is correct about the campaign spanges. They have been moved. The only explanation I can think of is that they were realigned sometime after the photo was taken. Either by the Looff, his tailor or more likely by a collector who thought they were not symmetrical over the China medal.